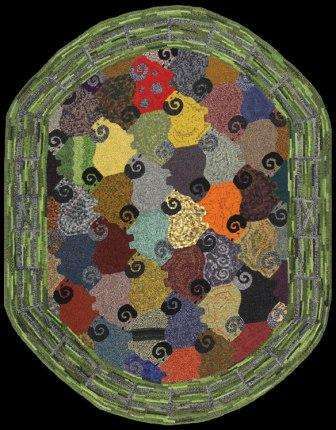 Gail LaPierre, Shelburne, VT was featured in the September/October 2010 Rug Hooking Magazine. Her rug, “Tessellated Frogs” was hooked in 2007 and is featured in the Studies in Geometry and Whimsy article in the magazine. Notable are Gail’s patterns, which marry geometry with an agricultural sensibility, as demonstrated in the tessellated designs titled Everything’s Sheepshape and Tessellated Frogs.